Why Bother To Use Solar Energy? For the first time in history, a major motorsports competition was won by a vehicle powered solely by solar energy. 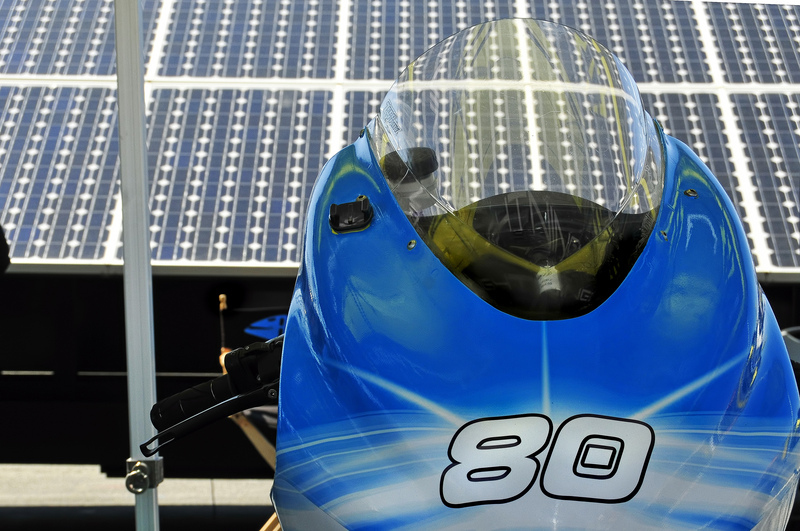 The Lightning Motorcycle Race team competed in and won the EPower/TTXGP race during the MotoGP weekend at Laguna Seca in July 2012, on solar power alone. The same bike, powered by solar, also set a new land speed record at El Mirage in November 2012. Lightning SB2 SuperBikes demonstrate that alternatively fueled vehicles can compete and win in current competition with currently available technology. Lightning Motorcycle’s CEO Richard Hatfield put this theory into a succinct statement; “Solar energy fueled vehicles are not just a theoretical concept to be realized sometime in the distant future, but a reality today that can compete head to head with gasoline powered vehicles”. Deciding to go with solar was an easy decision, it just took some extra effort to execute. We made the extra effort for a couple of reasons. First, Lightning wants to show that using an electric vehicle is not a compromise. We often hear people comment that electric vehicles are not reliable and are not a viable technology. By winning major competitions with our electric racing vehicles, we hope to help people to realize that electric vehicle technology is viable and efficient. ”Solar is a viable source of sustainable energy that allows us to power our superbikes for the race without a carbon footprint. The primary goal of the electric superbike is to win races, but we are certainly aware of the need to make fundamental changes within the transportation industry. Utilizing solar power is an opportunity for us to demonstrate the viability of clean power generation and to show how the technology can be applied the transportation industry” – Richard Hatfield, CEO. Secondly, Lightning wants to promote alternative energy. An electric motorcycles’ power storage needs are met by a system of batteries, whereas a traditional motorcycle derives power from liquid fossil fuels. Batteries, indiscriminately storing electricity, allow for flexibility in the methods by which power is generated for storage. That means the power fed to the batteries of an electric motorcycle can be harnessed from the sun, via solar technologies, or from the wind, or from running water, or – you get the idea. We get the idea, and we like it. The Lightning team is proud to be a leader in the racing world, testing and driving technology for the future. We love the idea of utilizing the racing platform to push the limits of technology while building a foundation for future industries. Lightning racebikes are virtually the same as our Lightning SB2 streetbikes, with only cosmetic changes for legality, and component changes based on customer preference. Not only are our Lightning Superbikes the fastest production motorcycles available for sale today, but they are also the most energy efficient. On the highway we can achieve more than 100 miles of range on just $1.20 of electricity. This is the equivalent of over 250mpg. Even at the Bonneville salt flats when we set the SCTA World Land Speed Records of 215.960mph, our range was over 20 miles. At our top speed of over 218mph we calculated that we were still achieving an equivalent of over 50mpg. “Our goal is that within the next two years we will set the fastest lap on the track at an AMA Pro Race weekend, gasoline or electric”. “The technology is developing very rapidly, [and] I can see a clear path to this goal”. -Richard Hatfield, CEO.